Like the old days - no computers or flashy stuff - the lady came out to confirm how much I had put in and then we had a nice chat for a wee while and I handed over the necessary cash. I have been looking forward to visiting the proper Caledonian Forest for years and years - and the best (that is road accessible at least) is in Glen Affric. I was not disappointed - it is a single track road and it must be awful in the summer but I had it all to myself for an hour or two - the birches just coming into leaf, the pines looking magnificent and in the distance the gentle clanking of a JCB and Bobcat 'dozer remaking the main walking trail in time for spring opening. A solitary and solemn visit - freezing temperatures, freezing wind and freezing rain. 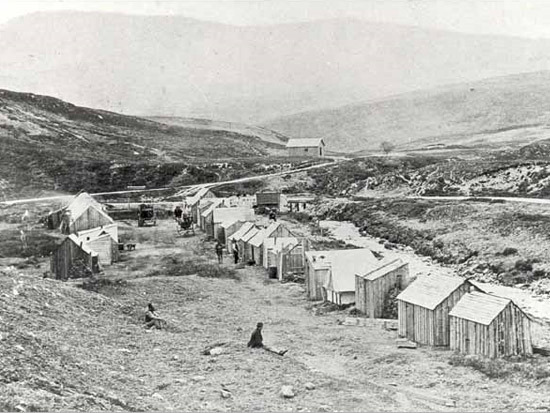 The original commando units were trained in the hills, lochs and mountains around Fort William. This memorial is in a stunning location - do stop and pay your respects. A rather challenging confluence - I have been orienteering 36 years and the forest was the thickest I have encountered - some of it must be naturally seeded as nobody would plant trees that close and certainly not on a slope that steep. The confluence had not been visited in 5 years - and then David Coombes on 29th March and me on 31st! Bent fence and what's that on the tree? In the end we settled on a £60 bottle from the Scapa Distillery - malted but un-peated (interesting) and distilled by concerned Highland Park employees while Scapa was officially shut down - just to exercise the equipment and maintain the otherwise mothballed plant in working order. Happily Scapa is back in production and you buy the 16 year old now. Forsinard is in the middle of the Flow Country - I first heard about this when it was at centre of controversy over 'Tax Breaks For The Wealthy". The government were encouraging destruction through draining and then planting of Europe's largest expanse of blanket bog. One name I particularly remember was that 'Mr Nice' - Sir Terry Wogan. Luckily that is all over now - and much of the area is under the protection of the RSPB as a bird reserve. Leaflets explained all about the "star species"
But, as suspected - on this last day before spring there were NO BIRDS AT ALL! Just like yesterday. I was there for an hour and a half - and just one little chaffinch - but that was in someone's garden. The visitor centre was very firmly shut - but there were maps of the bog walk. "Paved with slabs of Caithness Stone - you won't even get your feet wet". This may have been the case last year when the stones were laid - but the density of stone being about 2600kg/m^3 and sphagnum bog at close to 1000 meant that to complete the walk meant getting really quite wet indeed... Things sink in bogs - dense and heavy things sink particularly quickly. Leaving Forsinard - a drive along a traffic free and really very rewarding bit of road - and the RAF Tornado being very low and silly over Loch An Ruathair was very fun! Every trunk and every branch hung with ribbons, rags and clothes. In the leaden silence it all became a bit too spooky - well worship was outlawed a thousand years ago - but I have seen it in Mongolia, Cyprus, Kyrgyzstan and close to home on Clent Hills. Here the natural spring water exits near the top of the hill - perhaps why it was chosen as a "special place"
Inverness has boomed since I was last there - the locals tell me that "scum" have been relocated up from Glasgow/Cumbernauld and that the local economy has overheated and there will be trouble. I got this message all over - from Gairloch, Kinlockbevie, Thurso and Inverness. Certainly driving in off the by-pass it felt more like Urban Berkshire than Scottish Highlands. The restaurant quarter reminded me of the worst of Broad Street Birmingham - so I ate at McDonalds - cheap and quick fuel. Parking was a nightmare "one way street! ", "no stopping", "park here (full)", "short stay parking (full)", "No overnight parking (still full)" - at last I found a space in a pay-and-display - the meter would not take my money - as it was after 18:00 but there were no signs at all telling me when the parking charge started the next day - you can pay for 24hrs BUT NOT AFTER SIX IN THE EVENING!!!! *The office had a fantastic vintage maritime VHF radio - but sadly the bosses had recently decommissioned it in favour of mobile phones - a bit of a risk I think. Folks on the ferry very chatty - though very few true Orcadians - the manager was from Bristol. From (almost) the top of the island - views of the entire northern part of the archipelago - and a full 3G signal - why can't we get the same in our office in Birmingham? - I tried phoning John Brass - who is complaining about Vodafone on our behalf - but I only got his answer-phone - "there is almost no signal in our office..."
There must be a connection between my two favourite tombs - Almost identical construction and in very similar locations on two arms of high ground with fertile farmland in between. I met the current farmer* - just got into the dairying and bottling business with contracts to supply in to Kirkwall (most cattle farming in Orkney is beef) - hard work but profitable given that the next nearest dairy is a very long way south - I mentioned my time working in our Leominster dairy and we talked for so long it got dark - the flare and lights from the oil terminal clearly visible to the south - and I still had to visit my last tomb of the trip. *Beaten up Landrover, blue boilersuit and huge "farmer's hands". A short ferry ride from Gill's Bay to St Margarets Hope - lots of history and lots to see - and a full 3G signal the whole way! Skara Brae - they have a reconstructed house that you can go into - and the internal arrangement/furniture/division is just like in the traditional Mongolian Ger. My abiding memory is the intensely cold westerly wind, bearing the strong sent of "lemon pine disinfectant" - all was explained when the warden approached me wearing surgical gloves - in response to my raised eyebrow I was reassured that the (modern) toilets were being cleaned and that intimate or body cavity searches were not part of the Brae experience. ...Tomb Raider? I am in Orkney - working my way through the list of Neolithic Highlights provided by Cousin Chris.